Come to Singularity Hub for the latest from the frontiers of finance and technology as we bring you coverage of Singularity University and CNBC’s Exponential Finance Summit. Today there are 6.8 billion cell phone subscriptions—almost as many as there are people alive—and anyone can send a message to any other phone. Speaking at Exponential Finance, Bill Barhydt, founder and CEO of fintech startup Abra, describes the problem which has consumed him for many years: Even with all that hyper-connectivity, we still can’t send money as freely as we can send text messages. Sure, there are ways to send money using mobile devices, but all current methods are dependant on either wireless carriers or banks to transfer the funds. As Barhydt puts it, there’s no way to take the cash you have in your pocket, put it inside your cell phone and send it to someone else across the world—until Abra. Here are a few ways that Abra is changing the way we send and receive money globally. Uber and Airbnb have become the icons of the peer-to-peer economy—and Abra wants in on the game. Barhydt describes Abra as “the world’s first digital cash-based peer-to-peer mobile money transfer network.” In plain English, the app allows anyone with a smartphone to send money to any other smartphone anywhere on the planet any time of day. The company, currently in private beta, doesn’t ask for any personal details to sign up. Their goal is to be as “private as traditional cash but without introducing any financial intermediary”—meaning a bank or wireless carrier. The vast majority of people today don’t have bank accounts. Currently, to transfer money via mobile devices, you need to have an account with a bank or another intermediary such as PayPal. With Abra, you can link to your bank account, but you don’t need one to use the app. But how does it get on your phone? You’ve downloaded Abra on your smartphone. You have $10 in your pocket, and you want to send that cash to your brother in Egypt. You would use Abra’s app to find an “Abra teller” in your neighborhood (they might own a convenience store, for example, and become an Abra teller as an extra service). 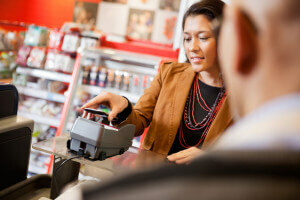 Each teller sets their own fee for the transaction—say 1% and a $0.75 fee minimum. Abra charges a small fee on top. You’d hand the teller your cash (plus fees) and get a notification that your $10 is now in your Abra account. “There’s no concept of escrow because the transfers are physically peer-to-peer,” Barhydt says. “The money is stored privately on your phone, so effectively, you’re becoming your own bank. This global network of Abra tellers makes it trivially easy for people to get the cash on and off their phone anytime they want. In the US, where most people have bank accounts, this may seem unnecessary, but in the developing world, it could be a game-changer. To date, Barhydt says they have signed up tens of thousands of tellers in the US and Philippines (the two initial markets Abra is deploying in), plus more in 100 other countries. Barhydt explains that on the $40 Android phone that he bought on the street in the Philippines, Abra is storing real blockchain-based smart contracts using technology that fixes the value of the fiat money versus the underlying Bitcoin technology in a way that the consumer never has to understand Bitcoin. Barhydt attributes the enthusiastic response to the service so far to the fact that in many countries around the world, there are tens of millions of people who make money selling pre-paid airtime on behalf of wireless carriers. To people who sell wireless airtime, the idea of buying and selling digital cash is very familiar. The startup, currently in private beta, plans to be live globally in 12 months. With the number of tellers they’ve been able to sign up so far, it’s not a stretch to say that it may have some significant impact in the developing world.